You can find all the Spin Palace Casino details in the table below. Spin Palace New Zealand is one of the premier online casinos in the country, featuring over 600 titles which include slots, blackjack, roulette and live casino games. The site also gives users the chance to acquire rewards the more the play through the Spin Palace VIP rewards program, which coupled with the seasonal and long term promotions give a range of perks and bonuses. Spin Palace Casino mobile app is available for users who enjoy playing their favorite casino games on their mobile device on the go. For more details on the Spin Palace Casino bonus, read the full review below. How to Get the Spin Palace Casino Bonus? Visit the Spin Palace Casino website and click on the ‘REGISTER’ button found at the top right hand side of the homepage. The Spin Palace registration form will pop-up in your browser. 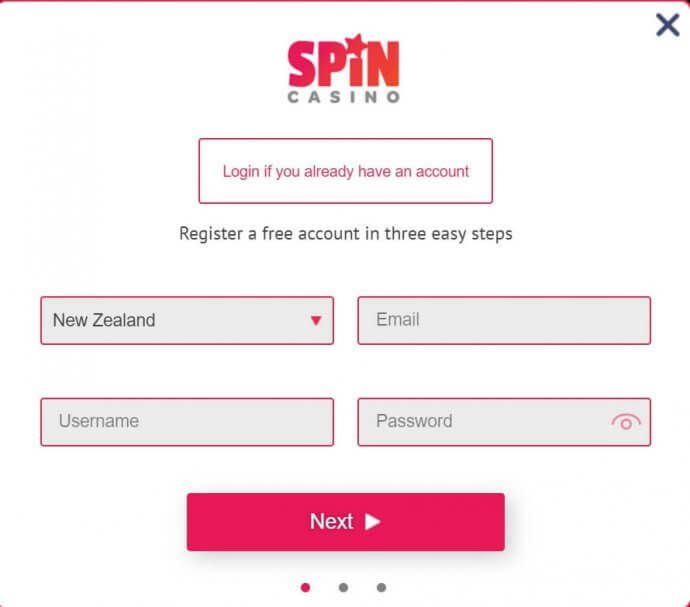 The first part of the form requires that you create a unique Username and Password combination which will be used as your Spin Palace NZ login. Click on the ‘Next Step’ button after you’ve filled out this section. The second part of the form will require you to provide personal details such as you full name, date of birth and gender. You may also pick the currency type you would like to use at the casino. Again, click on the ‘Next Step’ button when finished. The final part of the form will require your mailing address and mobile number. Click on the ‘REGISTER’ button when complete to accept the terms and conditions and complete the registration process. After you have successfully deposited onto the site the bonus will automatically be released. Deposit bonuses are available for your first three deposits. If you run into any issues claiming your bonus don’t hesitate to contact the Spin Palace customer support team who are available via e-mail or Live Chat throughout the day. The Spin Palace Casino can be accessed through a browser-based client on both PC and mobile device. The mobile browser-based client requires no download and gives users the ability to play a variety of casino games on their mobile device. A Spin Palace Casino Mobile App is also available for download for both Android and iOS mobile devices. The App can be downloaded by visiting the iTunes or Google Play respectively. The Spin Palace Casino Mobile App features many of the same games as the browser-based client and gives users the chance to use key features such as quick deposits and Live Chat Support with the touch of a button. Maybe you are interested in trying some other casino offers? Then check what ScratchMania and Winorama may have for you. One of the main selling points of the Spin Palace Casino is the wide range of casino games available on the site. Users may choose from slots, video poker, roulette and blackjack to go along with a range of live casino table games. Slots in particular are extremely popular at Spin Palace with hundreds of titles available including jackpots slots. Mega Moolah Jackpot and 108 Heroes. Spin Palace is known for providing its users with a variety of seasonal and long-term promotions. Most promotions give users the chance to win bonus money. The most popular bonuses come in the form of deposit bonuses or in some cases a Spin Palace mobile no deposit bonus. To keep up with all the new promotions, be sure to visit the ‘Promotions’ section of the website constantly and sign up for the Spin Palace newsletter on your primary email. Spin Palace is clearly one of the top options for online casino play in New Zealand. The ability to choose from hundreds of casino games and access the games via your mobile device from wherever you may be provides both convenience and variety for the seasoned online casino game player. Be sure to look into the rewards program and promotions section to ensure you don’t miss out on any great bonuses.